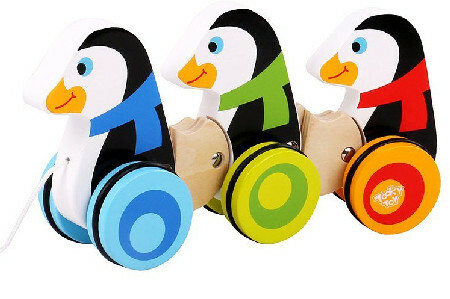 Pull Along Wooden Wobbly Penguins are 3 lovely penguins which wiggle and wobble as you pull them along. These penguins have six robust wheels with rubber inserts so it wont slip on the floor or damage it. This is a great toy for your little one to pull around the house and the penguins waddling wobble make it very funny to watch. The wheels on this toy are off center which is what makes the penguins look as if they are waddling. Material: Wood childsafe paint, rubber wheel inserts. We like this because: "Very well made and a lovely wobbly movement "